“I think many of us have different personas for different situations. I am sure that if any of you saw me on a Sunday afternoon slobbing in front of the telly and then saw me in a business meeting, you would be amazed at the difference. So, what is it that makes us so different in these situations? Are we being authentic in both sets of circumstances? Are we being true to ourselves? – if the answer is yes, then what makes us act so differently? And why don’t we use this to our advantage? Essentially what I am trying to drive home is the point that we are all acting, all of the time. We all have the innate ability to do this. We are not unfamiliar with putting on different hats for different occasions and we can use this to our advantage. I like to call this the Superman phenomenon. I remember watching Superman as a kid and thinking how stupid Lois Lane was for not realising Clark Kent was Superman. I mean he just takes off his glasses and changes his suit – it’s not like he has plastic surgery… But actually there is more to it. Superman only becomes Superman when he changes his persona. I.e. it’s not just the suit. We have the ability to transform ourselves into something extraordinary if we wear the right costume, use the right body language, use the right tone of voice, the right eye contact and right pose. When you think about it, it is an extremely powerful resource that many of us are unaware of. If we can train our brain to take on a persona that is genuine but useful for the given circumstances, we can transform our reality. How others perceive us is key but our own self-perception is equally as important. In fact, research has proven that adopting power poses, such as placing your hands on your hips for several minutes, before a tough meeting can lead to a better outcome. Literally taking on the pose of Superman can allow you to flourish. Amy Cuddy’s paper for Harvard University in 2012 backs this up and goes into some detail to show that expansive body posing can give you the sense of power but also leave you feeling better prepared. Being aware of how our body, mind and voice is linked gives us the ability to tap into Superman and leave Clark Kent slobbing on the sofa. I had a client who came to me wanting help with preparing for a job interview. It was a job she felt qualified for but at the same time, she was nervous that she just wasn’t good enough. I asked her to walk into the room as if she was walking into the interview room and sit down. It was a very simple task and no words were uttered. And yet it was obvious that she was uncomfortable and her shoulders were tense and tight. Everything from her shoulders upwards was tense. Her whole face and jaw was locked. And she had absolutely no idea she was doing it! After she came into the room for the first time and sat down, we analysed what she was doing. I asked her to do it again but this time, I asked her to open her mouth more. That was her sole task. I didn’t want her to say anything, just to come into the room and open her mouth more. As primal creatures, when we are in a situation that makes us feel tense and up tight, we can go into fight or flight mode. We can create tension in our body that isn’t needed. This was what was happening to my client. By opening her mouth, she relaxed her whole face. This relaxation led to her being able to breathe more easily, which in turn allowed her shoulders to relax and her whole persona changed. Amy also works with business professionals, both 1:1 and through group workshops. Check out her website at: www.peppedproductions.co.uk Should your company need help with presentation skills, pitching skills, networking skills, personal impact, creative brainstorming or improving customer service, do not hesitate to contact Amy via amy@peppedproductions.co.uk for a free consultation to discuss your needs. Link to ‘how to be present whilst presenting’, an online course in presentation skills. 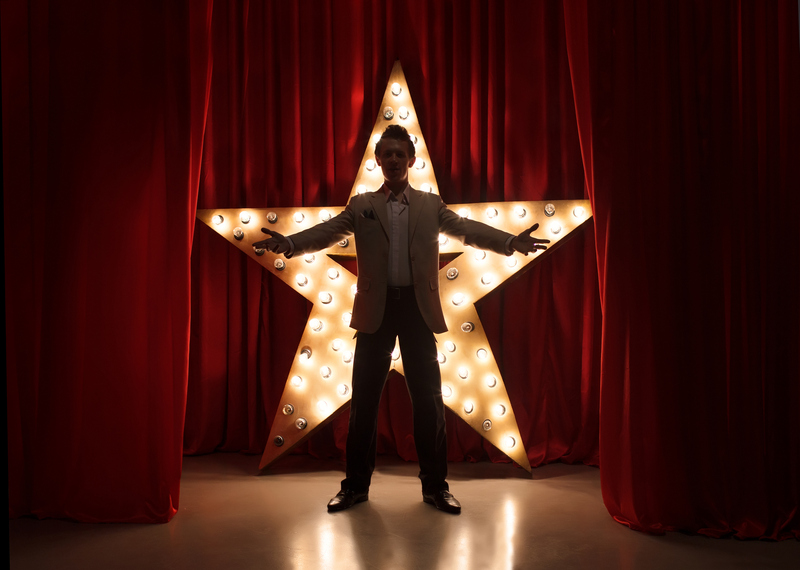 With a little imagination – you are capable of being the star at centre stage. Doing a presentation may fill many of us with dread but in a society which profits from your self doubts, why not like yourself as a rebellious act. Nurture your innate ability to communicate and invest a little in YOU. In a corporate environment we are often pushed into a “this is how I should act” mental attitude and very rarely step out into the limelight and show the world what we could be, if we applied a little imagination. But as Steve Jobs said: “Those who are crazy enough to think they can change the world usually do”. So now is the time for you to step into the spot, change the world but do it with flair! How many brilliant minds have been dismissed or overlooked due to lack of communication skills? I read about a brilliant study done by the Carnegie Institute of Technology which proved that 85% of your financial success is due to your ability to communicate, to negotiate and to lead. So if you are someone who is dreading a presentation, that could change the world…don’t be ignored, learn how to take centre stage and OWN IT. My course, ‘How to be present whilst presenting’ teaches you the techniques to do just that. It shows you how to stand, how to speak, how to breath and how to prepare. All you have to do is listen, apply these principles and you will be wowing your audience in no time. I am passionate about helping people reach their potential. I have had many clients who have started out as mice and ended up men. I had a client recently who felt she was unable to be ‘big’ and was so surprised when she managed it. It was within her – she wasn’t acting – it was just hiding under all of her inhibition. We did a great exercise where she had to give a 60 second pitch on why she is the best person for her job. Funnily enough the time limit gave her energy but engaging her imagination also brought her to life. I started to hear her relating stories of her childhood and as she painted a vivid picture, she brought her message to the fore. I could suddenly see her sitting in her mentor’s workshop at the age of 8, working alongside him and when she said that she had been an apprentice ever since, it was completely convincing. She proved it was in her blood but when we started the session, she had been sticking to the tried old tested methods of getting a job – listing all the technical requirements – and forgetting the human connection. So by getting it into her body, using her imagination and acting ‘big’ she had transformed into a speaker I could engage with. A speaker that was confident and ready to change the world. Amy Botes is a professional RADA trained Actress, Founder of PEPPED Productions and Communication Coach. She has just launched an online course: ‘How to be present whilst presenting’ now available via Thinkific. By clicking on this link: **Start rehearsals today! ** you will be taken to your first step in the journey! How to be present whilst presenting! For a limited few (until the 31st May 2017), this course is ABSOLUTELY FREE!! But get in fast or others will be centre stage before you. Simply add the coupon: YESAND and begin your journey to presentation superstar! So… why take this course?? We all have to communicate right? Whether you are a baby crying for milk or you are a businessman pitching his next big idea! What amazes me is that many of us forget how to use our natural skills and develop unhelpful habits that can inhibit us, leave us a nervous wreck and make us unable to communicate effectively. We can teach you how to be present whilst presenting, using the skills I have learnt as a Professional RADA trained Actress. By the end of this course you will have a ‘carpet bag’ of tools to help you get your message across including vocal techniques, a greater awareness of physicality and how to train your brain to help you overcome inhibition and unhelpful self-analysis. You will learn about how to warm up your voice before a presentation, how to use effective body language to keep your audience engaged and how to keep your mind clear and focussed. You will have a clear understanding on how to structure a presentation both from the point of view of writing it and performing it. You will learn how to help your brain memorise your presentation whilst being free and easy in your delivery. You will be introduced to elements of the Alexander Technique which can help you free your mind and body of tension and stress. Although I am going to let you in on the secrets of professional acting, I will not expect you to be any good at acting, all I am asking is that you tap into those natural skills we all have had since birth which have been covered up by years of bad habits, learned behaviours and past experience which has made you feel you are unable to present effectively. Being able to speak publically can open up many doors in the business world. From being able to pitch effectively to selling your products through sales presentations, this course will give you the skills to speak confidently and professionally and this in turn will allow your business to flourish. The more confident and engaging we are, the more likely people are to listen to you. You will be free of the shackles of inhibitions and able to take the world on by storm. Sign up for my course today and you will be let into the secrets of RADA’s world renowned training – something that has only been afforded to 3000 people in the last 100 years. Too good an opportunity to pass up? See you at rehearsals soon! ‘We all have that fear of getting up in front of people and speaking whether that be at a meeting, doing a presentation or performing on stage. But one piece of wisdom I will give you is this: Don’t be afraid – don’t take yourself so seriously. What is the worst that could happen by you opening your mouth? No small baby is going to die. Speaking up in a meeting is like speaking up at the pub and sometimes it’s the one that is the most drunk who is heard. Now, I am not saying: go and drink before a meeting! What I am saying is, if you leave some of your unhelpful inhibition at the door, this can be very helpful. Say you are going to a meeting and there are a lot of ‘powerful’ and ‘influential’ people there – approach it like you are just as powerful and influential. I dare you to take on the status of someone ‘higher’ than you – even it just gives you the courage to speak up. In fact I double dare you to prepare something and then get up and do it. At RADA we had a termly appraisal called: ‘Verse and Song’ and you had to get up in front of all your peers and teachers (people you greatly admire and want to impress) and perform a poem and song. A teacher of mine had said at the beginning of the course that this appraisal was probably the hardest thing you will ever do and bearing in mind, many of these people were to go on to be major Hollywood movie stars and sparkling stars of the West End and Broadway, this was saying something. The truth is, she was right – performing in front of your peers is extremely difficult. Seeing the whites of their eyes whilst you stumble through your presentation or speech can be a terrifying white knuckle ride! However, I remember that the one time I really nailed it was when I let go of my inhibitions – I like to call this ‘forgetting the brain’ – so forgetting the self analysis and just letting my body and my instincts take over. I trusted in myself and I just let the work speak for itself. I was nervous but that actually fuelled the performance rather than hindered it. Interestingly enough I think the less you care (about what the audience thinks) and the more you prepare the better. So next time you are in that meeting and you want to speak up – DO IT and FORGET THE BRAIN! You will be amazed at the results. Being bold and brave is all part of being confident. I am sure people we regard as the epitome of confidence – such as Churchill and Obama – all have their moments of self doubt. Nobody is completely confident all of the time. However, managing to prove to yourself that you are capable is half the battle. Amy Botes is RADA trained Actress who offers training to business professionals both through 1:1 coaching and workshops in the South of England. She is hoping to launch an online course in presentation skills via Udemy in 2017. This week Amy Botes is feeling PEPPED about corporate role play: “At a workshop I was involved in this week, we concentrated on the use of forum theatre to recreate a difficult situation at work in order to look at the different ways this could have been approached and dealt with. The premise of forum theatre is to use the power of the group to find the best solution through role-play. Using role play can have several benefits: it allows you to enter into the same mind-set you were in, when facing that difficult situation, but gives you the safety of a make believe situation in order to play with various options available and create different outcomes. A form of life rehearsal. Do you think your company would benefit from a Corporate role-play workshop, using professional Actors to re-enact difficult situations that could be improved upon? Then do not hesitate to give us a call and PEPPED Productions can fundamentally improve your approach to communication. Are you in a similar situation? Would you benefit from 1:1 coaching and would like to improve your personal impact? Then do not hesitate to get in touch to discuss a bespoke PEPPED 1:1 coaching package. Are you in a similar place? Do you think you or your company could benefit from 1:1 coaching to develop and increase your confidence? Then give PEPPED Productions a call! A note from our founder, Amy Botes: "Business is often seen as dry and calculating but as I have found out, creativity is at the core of everything we do. As a RADA trained Actress, I have realised there is huge value in the abilities of an Actress in a business context. For example: to be present whilst presenting, to build up rapport and real connection with customers and other businesses, to appear confident and to use creativity to expand the vision of a business. My business offers business workshops to companies who feel they need direction when it comes to presentations, to help them hone their communication skills when communication is at the core of their business, to pep up their pitching skills and to give them a structure whereby they can boost their confidence and say yes to new ideas. Having had over 15 years worth of experience in the acting field, both on stage and screen, I offer world class training both via 1:1 coaching sessions, business workshops and short courses. This can be provided in house within the heart of a business or at various conference centre locations within the Milton Keynes and Northampton area. The Pepped mantra is : listening, acting and reacting to the business problems we are presented with. The 'yes, and..' mentality. "